Ivan Dolac from private and careful production! Grape comes from one of the best positions that exist in Croatia. Quantity is very limited. Best of the best in terms of plavac mali! This wine is in many ways special. First you perceive the beautiful deep red color. Immidiately after opening - taste is incredibly fruity - in the style typical of hvarski plavac – particularly sour cherries. After getting some air, complex notes develop, suggesting that the wine has high potential. 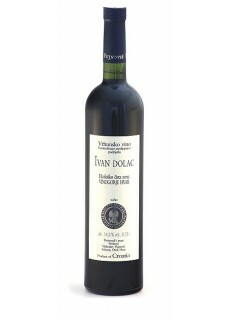 The body is respectable with very smooth and ripe tannins - making it one of the most modern wines made from plavac mali. The wood is completely merged with the aroma of wine. In our opinion - the top of Croatian winemaking! Vjekoslav Vujnović uses exclusively new barrique barrels for this wine. In the vineyards and the winery, artificial fertilizers or synthetic protective materials are forbidden. Keep it or drink. You will not regret it! Wineyards and winery from Vjekoslav Vujnović are located on the south end of island Hvar, far away from all the other well known producers. By using organical farming principles and spontaneous fermentation by wild yeasts, he captures the very essence of plavac mali grape. His wines are very well known for soft tanins where he stands out from the crowd. Be it his Ivan Dolac (top position single wineyard plavac mali) or his very well known Plame, also plavac mali - he manages to make superb quality wines, but in very limited quantity (total production less than 20.000 bottles).